State machines are found everywhere, whether they are fleshed out initially as such is a different matter. In an application it's common to see different states being represented as an enum, and the transitions replace the current state with the next based upon some logic. If we take an email address as a real world example, the application must be capable of representing an email address in both verified and unverified states. The type becomes less focused, and even more difficult to construct. Instead of saying what an EmailAddress is it's starting to say what an EmailAddress can be dependent upon state. There is another way to do this. The F# type system is advanced enough to allow us to represent these states directly - as discriminated unions. Much better, now an unverified email doesn't have to concern itself with a VerifiedDate or any other fields that might be there. So this is a very simple example, we only have 2 states; Unverified and Verified. An email address must be in 1 of either of the 2 states. It's either verified, or it is not. Now we have the states fleshed out, we need to define transitions (or events) which have the responsibility of governing the states, in other words; from state A to state B. So using the email example, we really only have one transition, and that's an UnverifiedEmail becoming a VerifiedEmail. You can see how the verified transition handles a VerifiedEmail by just returning it. We also need a way to create an email address, but that's easy, a new email always begins it's life as unverified. Before continuing, let's take a closer look at that verify function. You might be wondering why our verify function doesn't just take an Unverified email directly and have done with the match? We could do this, but how would we handle the other state? Each transition must take and return the whole state machine. Each state needs to be handled somewhere, it's best handled by the transition function rather than the caller, it's much easier to encapsulate and while also being explicit about the logic of our system. F# will also help you out on this as the compiler will warn you whenever you don't match against every possible case, win. Lets use the same principals and apply it to another real world problem. Payments. We will need to support multiple payment types. So I'll just go ahead and put a few in for this; VISA, PayPal and a CashCard. I'm sure there will be more but for the sake of keeping things simple i'll stick with these 3. Pending, the transaction is currently being processed. Declined, the transaction has been declined. Completed, the transaction has been successfully processed. The Unsigned and Pending states only require actual TransactionData. Additionally, the Declined state can also include a Reason for the failure and a timestamp. The Completed state should probably also include a timestamp. 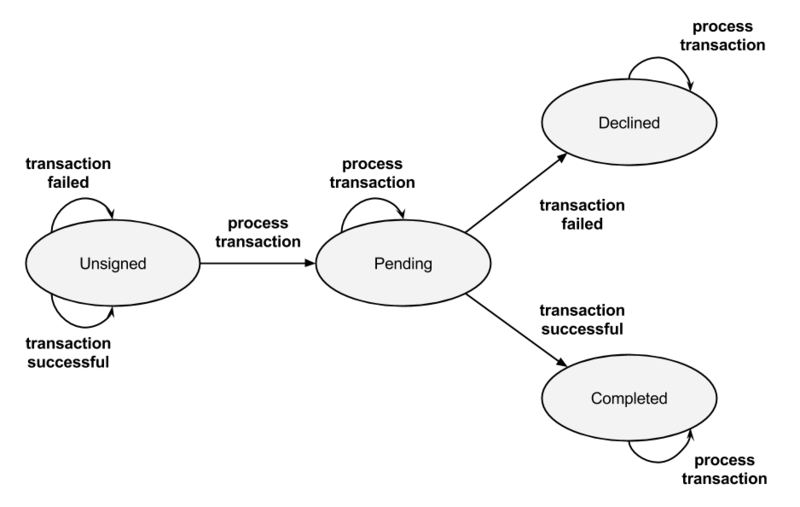 The transitions involved are simple, the payment process follows a very linear path without any deviation really. The transaction can be in only one state at any given time (which is the whole point) and all cases are handled explicitly. It's certainly helpful to look at the system more abstractly using a diagram or table. Now to write out the transitions. In most cases, you would probably want to handle the side cases in other ways than just returning the transaction which was passed to the function. Especially with the Declined state, the system might allow a Declined transaction to be reprocessed - which I haven't catered for here, but would be a simple change to make. So that's the machine done. All that's left to do is to use it. We still need a way to actually send a payment/transaction to be processed. This is a good opportunity to use F#'s MailboxProcessor to create an agent or actor. The agent will receive transaction messages as they are sent to it and handle them however we see fit. The main reason i'm using an actor here is they are very easy to scale and allow us to build in supervision. In a real project, I would recommend Akka.NET for such tasks.